The capital city of Rajasthan, Jaipur is the largest city in India, in terms of size. It is an entrancing city and is one of the most culturally rich and ornamental states in India. Jaipur is also known as the “Pink City” owing to the trademark building color. The grandeur of the city is the Royal culture it continues to maintain. Amidst all, this colorful city has heavily busy streets, full of life, both young and old. The chaos and mayhem of the city streets, the busy markets, and the heavy traffic on the narrow market lanes, all brings its own charm to this beautiful city. Places to see: The famous tourist attractions in Jaipur are the City Palace, Hawa Mahal, Jantar Mantar, Jal Mahal, Sun Temple, and many forts including the Amber Fort, Jaigarh Fort, and the Nahargarh Fort. Famously known as the “Sun City,” Jodhpur was founded by Roa Jodha in 1459. It got the name “Sun City” owing to the bright and the sunny weather all through the year. The city is divided into two: the old and the new city. While the old city is surrounded by a long wall and eight gates lead out of it; the new city is outside the walled city. It is a very popular tourist destination. The mesmerizing landscape of Jodhpur is truly a sight worth viewing. Places to see: The city has many architectural palaces and forts such as the Mehrangarh Fort, Jaswant Thada, Umaid Bhavan Palace, and Rai ka Bag Palace. Other attractions in Jodhpur include the Government Museum and the gorgeous Umed Garden. Founded by Maharana Udai Singh in 1559 as the new capital of the Mewar Kingdom, Udaipur, the “Lake City” of Rajasthan is often referred to as the “Venice of the East.” Udaipur is famous for performing arts and crafts and for its plethora of zinc and copper mines. Housing the largest artificial lake of Asia, the Jaisamand Lake, and one of the best solar observatories of Asia, Udaipur is a marvel in itself. The miniature painting of Udaipur is also renowned worldwide. Udaipur also houses beautiful palaces, lakes, and gardens. Places to see: Shilpgram Village is a complex where one can buy traditional arts and crafts. 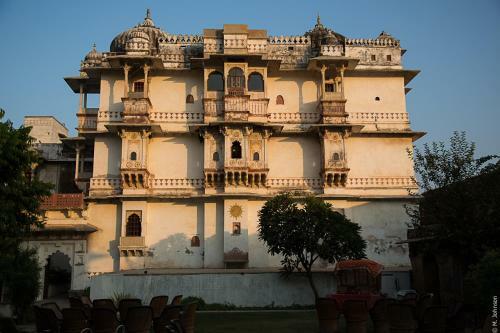 City Palace, Lake Palace, and Bagore ki Haweli are some major tourist spots in Udaipur. The town bordering the Thar Desert is Pushkar. It is the town of fairs and festivals as it is a sacred Hindu site with 52 ghats set on Pushkar River. It is a city of hundreds of temples, including the most famous 14th-century Jagatpita Brahma Mandir, dedicated to Lord Vishnu, the god of creation. The temple has a distinctive red spire and walls inlaid with pilgrims’ silver coins. Pushkar is also known as the “Rose Garden of Rajasthan” as the Pushkar rose is famous worldwide. Pushkar also houses Gurudwara Singh Sabha to mark the visits of the first and tenth gurus. Places to see: Other top tourist destinations in Pushkar are Varaha Temple, Savitri Temple, Ranji Temple, Man Mahal, and many more temples. Established by Shakambhari Chahamana, Ajmer was the Chahamana capital until the 12th century CE. Surrounded by the Aravali Mountains, it is a pilgrimage center for both Muslims and Hindus. Ajmer houses the shrine of the Sufi saint Khwaja Moinuddin Chishti. Ajmer has also been selected as one of the heritage cities for the HRIDAY (Heritage City Development and Augmentation Yojana). Places to see: Ajmer houses several dargahs and is also a base for the Pushkar Pilgrimage. “The Golden City,” Jaisalmer, is west of Jaipur. This World Heritage Site lies in the heart of the Thar Desert. Jaisalmer is located on the ridge of yellowish sandstone. Crowning Jaisalmer is the fort, containing the palace and several ornate Jain temples. Places to see: Of the many tourist attractions, the Jaisalmer Fort and Jain heritage including the Lodhruva Jain Temple and numerous museums are just a few of the many sights. Found by Rao Bika in 1486, Bikaner is famous for its Junagarh Fort, Karni Mata Temple, Lalgarh Palace, and many other tourist destinations. Bikaner, situated in the middle of the Thar Desert, has a hot semi-arid climate with very little rainfall. Places to see: The Karni Mata Temple is home to many rats and is considered sacred by Hindu devotees. Alwar houses one of the most haunted places of India, the Bhangarh Fort. This fort has many ghost stories and is also famous for its historical ruins. Places to see: From the various tourist attractions, the Bala Quila Fort, Sarika Wildlife Sanctuary, Siliserh Lake Palace, and the Vijay Mandir Palace are just a few. Mount Abu is bestowed with all the natural, historical, and architectural beauty any place can have. It is a tourist destination and the Dilwara Jain temples are one of the complex temples carved from white marble. Places to see: The Achalgarh Fort, Nakki Lake, Adhar Devi Temple, and Guru Shikhar are also among the many places of tourist interest. Bharatpur, famous for its Keoladeo National Park, is also known as “Lohagarh” and the “Eastern Gateway.” A large number of national and international tourists visit Bharatpur as it lies on the Golden Tourism Triangle of Delhi-Jaipur-Agra. Places to see: The major tourist attractions of Bharatpur include the Lohagarh Fort, Laxman Ji Mandir, Ganga Mandir, Vishwapriya Shastri Park, Moti Mahal, and more. "Who knows what you may see"
Rajasthan provides you with a rich platter of heritage and culture. It gives you a great variety of marvels of the world in just one state. Every city of Rajasthan has its own story to showcase with their vast and mesmerizing historical buildings and the breathtaking scenic views. The tagline “Jane Kya Dikh Jaye,” translated as “Who Knows What You May See,” is very apt for the tourism of Rajasthan as one can be surprised by what Rajasthan has to offer to their visitors.